Use our credit calculators to see how much! Wondering how to build credit? Become financially savvy through our financial intelligence training and the refresher™ blog. Sign-up to receive our monthly newsletter with tips and tricks to improve your credit score. 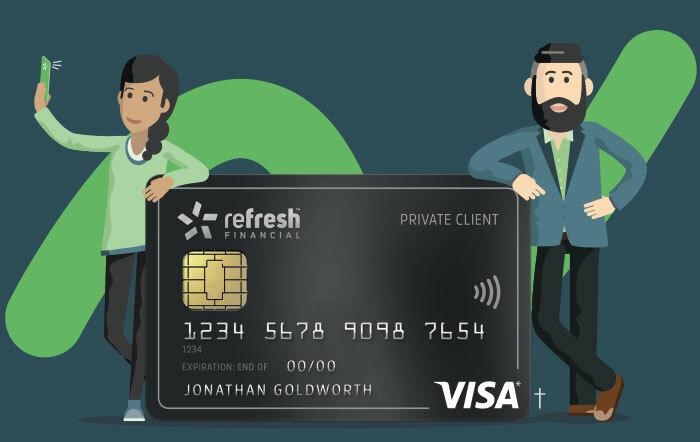 I AGREE THAT REFRESH FINANCIAL CAN COMMUNICATE WITH ME USING EMAIL, SMS AND PHONE. THIS COMMUNICATION MAY INCLUDE PROMOTIONAL MESSAGES FROM TIME TO TIME. YOU CAN OPT OUT AT ANY TIME. our monthly newsletter with tips and tricks to improve your credit score. †Artist Rendering. Actual cards may vary, in design, materials and/or function from that shown in the image above and may be modified from time to time by Refresh Card Solutions Inc. without notice.